With a lot of chatter going among folks about Apple Inc. upcoming iPhone 6 and iOS 8, here is another dose of it. A couple of screenshots emerged out of the Chinese micro blogging website Weibo, telling Apple fans how the upcoming iOS may look like. As per the screenshot revealed, iOS 8 will be having square icons with rounds corners, and is very much like the current iOS 7. It also includes some more apps like Preview, TextEdit —-these apps have been a part of Mac OS X for few years, and Health Book. Not enough to say but TextEdit is supposedly to view the documents and PDFs, not for editing files with it. While Apple keep its upcoming products under a tough layer, 9to5Mac, which has proven to provide concrete news about upcoming products and services from the company, says that these screenshots are legitimate at their end but since its not official a lot of changes are expected to come up, it could be anything from re-doing the icons or adding more features. This new iOS 8 will come bundled in upcoming iPhone 6. Without any clear hardware and software specifications, the phone is expected to have a never been seen before 6-inch screen and a Touch ID fingerprint scanner like the one coming in iPhone 5S. 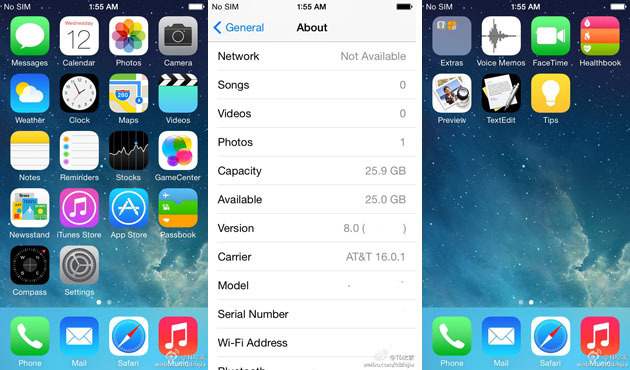 The iOS 7.1, which was recently rolled out for iDevices has seen some great changes. It has shown improvements in Siri and various issues troubling iDevice owners. Company at this very point tends to work and improve user’s interaction with the iOS, but in recent days the company has seen some serious security flaws regarding certificate authentication in both Mac OS X and iOS. By improving overall iOS 7.1 performance, the company is also aiming to improve its cloud service iCloud. With only 5GB of storage and difficulties in sending files, iCloud is much of a trouble to its users. Everything about iOS 8 is not official yet and so more rumors are expected to come up.